As a Consultant in Applied Nutrition and Supplementation I can give Prescription Nutrition programs for Obesity and type 2 Diabetes and Weight Management as well as nutrition and supplementation for muscular hypertrophy (growth). I am passionate about educating my clients to fuel their bodies correctly and to understand the consequences of poor diets and this includes the ones that cut out complete food groups including extreme low calorie diets. These diets will sabotage your long term fat loss goals leading to yo yo dieting. My goal is to stop this allowing you to change your lifestyle for good. Diet isn’t just about losing weight – it impacts your energy levels, sleep, stress levels, skin and more. Understanding what we put into our diet helps us learn what we’re getting out of it too. Every Stabilis Fitness client receives guidance and education to compliment their goals and training program to include recipe books which are calorie and macro counted. 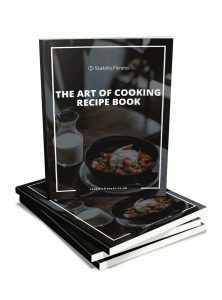 Why not get ahead of the rest and download my FREE 70 PAGE RECIPE BOOK calories and macronutrient counted and myfitness pal barcodes on each recipe. GRAB this now straight to your inbox. A healthy diet helps protect against malnutrition in all its forms, as well as non-communicable diseases (NCD,s) including diabetes, heart disease, stroke and cancer. Unhealthy diet and lack of physical activity are leading global risks to health. Healthy dietary practices start early in life – breastfeeding fosters healthy growth and improves cognitive development, and may have longer-term health benefits, like reducing the risk of becoming overweight or obese and developing NCDs later in life. Energy intake (calories) should be in balance with energy expenditure. Evidence indicates that total fat should not exceed 30% of total energy intake to avoid unhealthy weight gain (1, 2, 3), with a shift in fat consumption away from saturated fats to unsaturated fats (3), and towards the elimination of industrial trans fats (4).